We've been homeschooling now for about 3 years. The longer I do it, the more I love it. I especially love how flexible we can be with each child in their pursuit of education. My second born child, Zoe, is 6 years old. She has a drastically different personality than her older sister who skipped a grade plus some. Zoe often approached learning with a, "What? You want me to learn that?!" type of attitude. She happens to have a birthday just before the school year cut-off, meaning that in a traditional school setting, she would have been one of the youngest in her grade. Since she was a toddler, and even before I knew we'd homeschool, I had said I'd hold her back a year. My sister in law, a teacher, calls it the "gift of an extra year." After our experience, I'd definitely say that's a true statement! 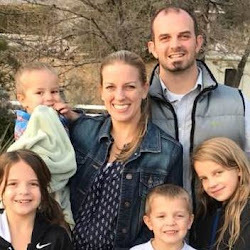 When fall rolled around last year and she had just turned 5, I was finally able to figure out how this whole "holding back" thing as a homeschooler would work within our family. In a traditional setting, you are only allowed to start a grade in September, and you always end a grade in May. Should she decide in January that she was eager to start some more formal Kindergarten schooling, that would not have been an option for her. She would've been made to wait until September again. Silly, isn't it? 1. We purchased all of her Kindergarten curriculum even though we had no plans to start right away. Having the books available meant that at any point in time, she could decide on her own terms that she wanted to do "school", and that I'd be ready for her. Since we already had the curriculum books from our first daughter, and I had no plans to change curriculum, all I needed were the workbooks. Easy enough. 2. For that entire "school year" (September 2014 through May 2015), I let her do school on any day she so desired, and skip it on any day she wanted. After all, this was not her official first year of school, so it's not like we were missing anything. I viewed anything she did during this school year as a jump start to her actual Kindergarten year. 3. I let her call herself a Kindergartener, which made her so happy! At the end of May 2015, she had completed approximately half of her Kindergarten year. She was beginning to show more interest in reading, and was asking more regularly to get her school books out. We did some school through summer. 4. At the start of the fall 2015 school year, we jumped right in, daily, with her Kindergarten curriculum. By now, she was incredibly ready for school, and was thrilled to learn more. My thoughts on her needing an extra year were spot on. While there were still days I had to coax her into her lessons, there was very little push-back on her end overall. That extra year, I believe, was critical to her love for learning. By November 2015, she had finished up the second half of Kindergarten. That means, she did half a school year in about 2 months. She was totally and completely ready, and completing double lessons in each subject every day. We dove right into 1st grade in November, and have been chipping away at that ever since. By allowing my daughter to be held back a year in school and decide for herself when she was ready, and by not pushing her to meet some silly state age set standard when she was clearly not yet ready, I truly believe we helped Zoe start school off right with a love of learning. The LAST thing I would have wanted was for her to hate school from the start. Pushing a child to start school too young can have negative consequences. The results of waiting were that she loves learning and actually "caught up" anyway! It really was "the gift of an extra year." I love that homeschooling allowed us to have so much flexibly with Zoe's education. We could hold her back while still letting her jump in whenever she desired. We were able to follow her lead, and not push her to do something that she was not ready for. And, at the same time as we were holding back Zoe, our firstborn was moving ahead! 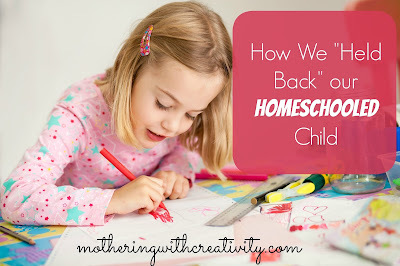 I LOVE homeschooling, and I LOVE that my kids get to learn at their own pace. Every child has their own pace and rhythm, and homeschooling allows us to mold their education around THEM. Homeschooling for the win! 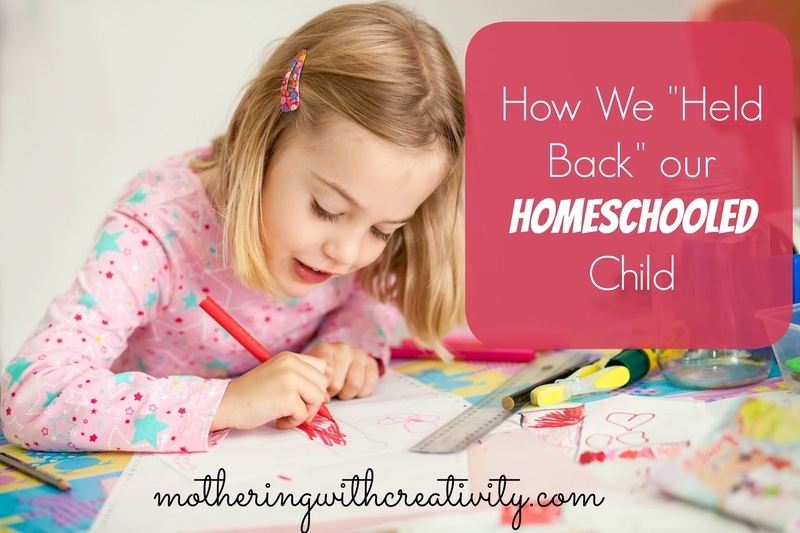 Have you ever held a homeschooled child back? What tips do you have?